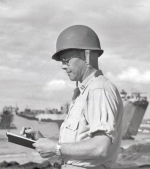 A painter, educator, graphic artist and illustrator, Dwight Shepler was a Navy combat artist during World War II from 1942 to 1946 and was awarded a Bronze Star for his achievements. Hornblower has been promoted to Rear Admiral and has been named in command of the West Indies station, i.e. the Caribbean, with a squadron consisting of three frigates and fourteen brigs and schooners. This omnibus includes Commodore Hornblower (The Commodore), Lord Hornblower, and Admiral Hornblower in the West Indies (Hornblower in the West Indies).